The view of Dragon Island from the cliffs of Mudjin Harbour. Dragon Island at Mudjin Harbour Beach, Middle Caicos. Dragon Cay is a small limestone ironshore island at the famous Mudjin Harbour beach on Middle Caicos. This cay and Mudjin Harbour is one of the top scenic spots in the Turks and Caicos, and a favourite location for landscape and travel photography, and as a beautiful destination to explore on day trips. This location is one of the top ten beaches in the Turks and Caicos. Dragon Cay is found about 200 feet (70 meters) off the main beach at Mudjin Harbour, and is connected to the mainland by a sand bar, which is exposed under most tide conditions. This island doesn’t support any vegetation, yet it’s a great spot to see the intricate and treacherous limestone shoreline locally known as ironshore. Dragon Cay is the centrepiece to most Mudjin Harbour photos, and when viewed from the beach, the outline of this rock resembles a dragon, with its head pointing east. A little beach, protected and overshadowed by the island, can be found on the interior side of the cay. Much of the coasts in the Turks and Caicos consist of unparalleled white sand beaches with gentle dune backdrops, and Mudjin Harbour is one of the few outliers, and is bit reminiscent of famous Caribbean beaches such as Horseshoe Bay Beach and Stonehole Bay Beach in Bermuda and Bottom Bay in Barbados, which are framed by majestic cliffs. Ironshore limestone rock at Dragon Island. Mudjin Harbour offers a bittersweet snorkelling situation. Weather and ocean conditions are typically too rough for pleasant snorkelling, yet when the ocean is calm, the underwater visibility is incredible and the sights are amazing. 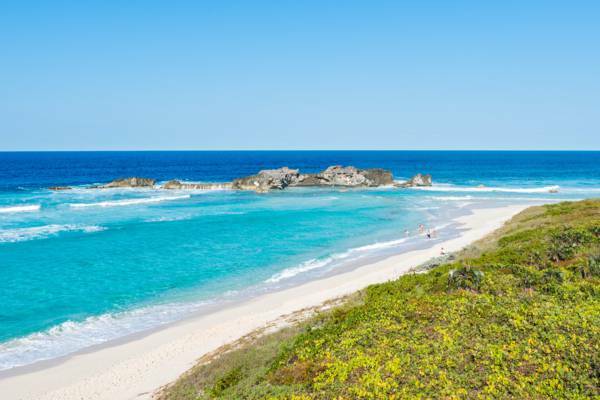 Mudjin Harbour and Dragon Cay is located quite close to the edge of the Caicos Islands underwater plateau, and the edge here, or wall, drops from about 40 feet (12m) into the thousands. The depth transitions and vibrant blue water supports corals, fish and larger sea creatures. North Caicos and Middle Caicos have several tiny island attractions. In addition to Dragon Cay, there’s Three Marys Cays, Pelican Cay at Bambarra Beach, and the beautiful Bay Cay near Horsestable Beach in the East Bay Islands National Park. Wave breaking over Dragon Cay. Mudjin Harbour and Dragon Cay is an exquisite coastal region, yet there are quite a few dangers and hazards to be aware of. Much of the rock on this cay is razor-sharp limestone. Great care should be taken when climbing, as a slip or fall can result in serious injuries. 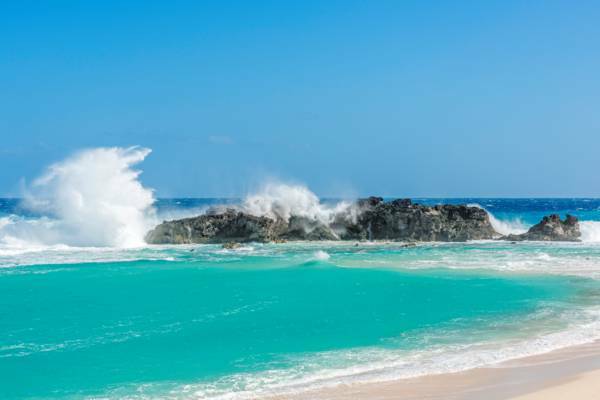 Due to being located on the edge of the Caicos Islands underwater plateau and very close to deep ocean water, there can be a high ocean swell breaking at Mudjin Harbour at times (which is very powerful). Beware of unpredictable wash or spray from waves. 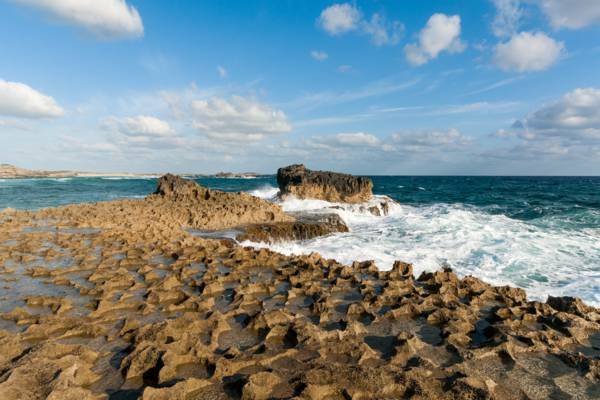 Marine limestone, which is the only type of rock common in the Turks and Caicos, is relatively soft and breaks easily. We highly advise against climbing and cliffs or rock faces. When the ocean swell is up, there can be a powerful wave wash over the sandbar to the Dragon Cay. This can easily wash persons into the adjacent ocean water on either side of the island. If the waves are large, we recommend not venturing out. The coastal region that surrounds Mudjin Harbour and the Crossing Place Trail supports the poisonous Coral Sumac tree, which will cause skin rashes if touched. We advise that you not venture off of paths if you are unable to identify this plant. One of the few recorded shark attacks in the Turks and Caicos occurred off of Dragon Cay in 2011. In this situation, a swimmer off of the north of the cay received a strike to his shoulder in low visibility conditions. He received local medical care and 18 stitches. Last reviewed by an editor on 31 January 2018.